Lady Hester Stanhope left several boxes and trunks of her affects in the charge of her brother Colonel James Hamilton Stanhope when she left England in 1810. One such list survives, and was made out by either Miss Elizabeth Williams, a connection of William Pitt as well as Lady Hester, or else by Mr. Rice (also a servant in Pitt or Lady Hester's employ). In particular, one such item calls for special attention. There was a "Leather Trunk marked E.W. [Elizabeth Williams]"  and its sole contents included "Mr. Pitt’s State Gown of Black Silk with Gold lace - the lace tarnished, the silk in good condition.”  As Elizabeth Williams remained with Lady Hester Stanhope following the death of Pitt, and left England with her Ladyship, it is likely that Elizabeth also left some of her possessions with James Stanhope. Perhaps her and Lady Hester were unaware at that time that neither of them would return to England. What I found perplexing is that Mr. Pitt's precious state robe was to be found amongst Elizabeth Williams's possessions, and not Lady Hester Stanhope's affects (Lady Hester was Pitt's beloved niece). What is known is that Pitt paid for Elizabeth and her younger sister Louisa Jane Williams's education, at least from 1797 until 1801, and she was in Pitt's household from 1797 until his death in January 1806. To find out more about Miss Elizabeth Williams, please read my previous posts about her mysterious connection to Pitt here and here, where I have questioned both her identity as well as her parentage. Returning to the contents of Elizabeth Williams's leather trunk - Pitt's State Gown - it can be deduced that the gown remained in England with Colonel James Stanhope, and is the same gown that was later used by British politician Benjamin Disraeli whilst he was Chancellor of the Exchequer between 1852, 1858-9, and 1866-68 . 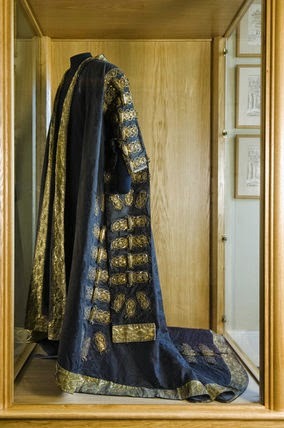 The "black silk damask robe" is now housed in the Bartolozzi Room at Hughenden Manor in Buckinghamshire, which was formerly the residence of prime minister Disraeli between 1848 and 1881, and is now the property of The National Trust . By repute, although it has not been definitively determined, it was originally made for William Pitt in the eighteenth century . Although it has not been fully confirmed that this particular state gown was once worn by William Pitt, it certainly matches the description given in the inventory. Both are "Black Silk with Gold lace,"  and although faded by wear and the passage of time, it is probable that this is the same robe. The tarnished lace may be long gone, but as the "silk [was] in good condition,"  it may be presumed to have survived the test of time. It can be viewed today by any curious member of the public who wishes to visit The National Trust property at Hughenden Manor. 1. Dr. Charles Lewis Meryon's papers. The Wellcome Library, MS 5689, f. 112. 6. Dr. Charles Lewis Meryon's papers. The Wellcome Library, MS 5689, f. 112. Figure 1: William Pitt the Younger (later Disraeli)'s black silk damask robe. 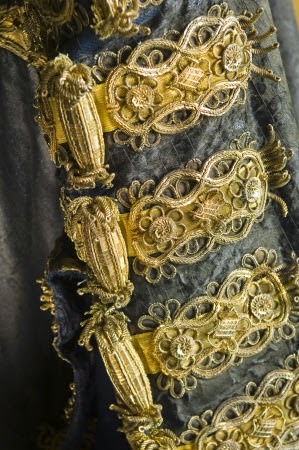 Figure 2: Detail of Pitt's State Gown. Both images are from this source: http://www.nationaltrustimages.org.uk/image/153645.